I just got two mirrorless bodies a couple of days ago. One from Sony and the other from Olympus. It’s my first true mirrorless experience — I’ve been a Nikon user since the day I started doing photography. All the equipment that has been sent is loaned and I am not being paid for this review — it’s important for me to mention that. My goal is to share my thoughts on my personal experience and highlight the strengths of both systems. I know conversations can get passionate when people are talking about full frame sensors, crop sensors and micro four-thirds sensors or about this brand and that brand. I won’t get into that. I know I have in my hands two extremely capable camera bodies and all I want to know is: Would either one of them make it worth switching from my trusty D750? Ready? Let’s jump into it! A white tee and a pair of jeans vs. a black tuxedo? Well played Olympus, you definitely got me on this one. The Sony box includes: a9 body, battery (1), battery charger, strap, USB cable and the little manual nobody reads (this camera retails for $3,998 at B&H). The Olympus box includes: OM-D E-M1X body, batteries (2), charger, strap, USB cable and the little manual nobody reads (retails for $2,999 at B&H). For the sake of this comparison, if I wished to have the same setup than the out of the box with Olympus, I’d have to buy a vertical grip and extra battery (that would be an extra $376 for a total of $4,374). Remember, I don’t have any lenses yet. Sony’s vertical battery grip has to be bought separately. Maybe size does matter to you, maybe not. Anyway, I thought it’d be fun to compare both bodies with the same setup by adding the vertical battery grip to the a9 (the E-M1X’s is built in). I also already put the maximum amount of batteries I was allowed to in each one of them (being two for both). As you can see, the a9 is slightly heavier by 44 grams (I take advantage of this moment to thank Starfrit for sponsoring this scientific test in my kitchen). 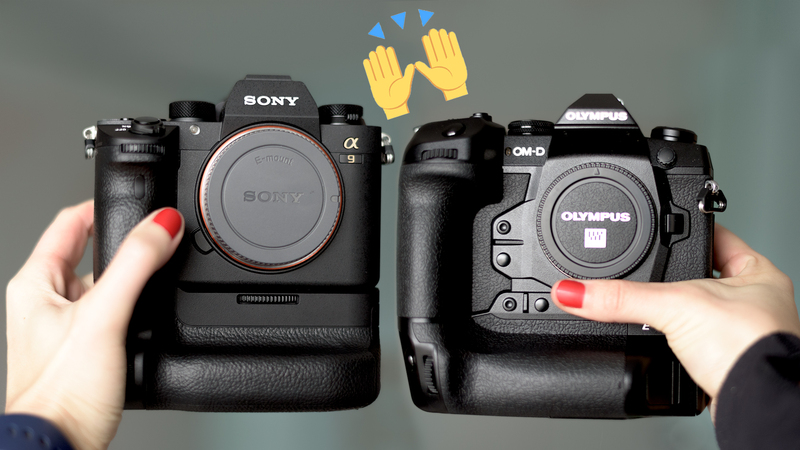 For more in-depth specs and technical comparison, you can click on this link to learn more about the a9 and this link for the E-M1X. Again, I have to give another point to Olympus. The E-M1X ergonomics are wonderful. It feels really good in my hand. (Just for you to remember, I am a 5’4″ female). The grip is slightly wider than the a9’s and reminds me somehow of my D750 grip — which I like. It has a little hook for my fingers so I could carry the body hanging on my side while walking. The Sony is slightly heavier and narrower. It’s very well built and compact and feels like you’re dealing with serious stuff. Enough of staring at each of these handsome cameras. It’s time for a first date with each of them! In my next article, I’ll be sharing my experiences during a real-life photoshoot using the a9 with circus artists and dancers. I also have an upcoming photoshoot at an Olympic Weightlifting meet where I’ll to put the Olympus E-M1X to the test. If there’s something you’d like me to try (that is sports related), please leave a comment below and I’ll make sure to include all the suggestions I can realize on my upcoming articles. Until next episode! 1. On the Olympus try the HDR function by putting a strong back light on the weight lifter. See if the face can look natural. 2. On the Olympus try the focus bracketing. Look for an unattended weight. At about a 30 degree angle focus on the front edge, and see if the resulting image is in focus. Got it Larry! Couldn’t make it yesterday but I’ll try to do it on my next O-lift photoshoot! Thanks for your ideas! When I first moved from a DSLR to mirrorless it took me the usual couple of weeks to adjust to the new camera. But what I didn’t account for was how long it would take me to break my bad habits from a DSLR. Yep, bad habits. You shoot differently with a mirrorless camera, you don’t need to chimp for instance. Adjust the exposure to what looks good and shoot. The other thing that will ruin you for a DSLR is the functionality in these cameras, particularly the Olympus will blow you away. Honestly I’m not sure a DSLR shooter can do an objective review of a mirrorless camera until they spend some very serious time with mirrorless. I’m not talking days, I’m talking weeks and months to figure out everything it can do and to adjust to it. Without that time you’re going to be viewing it as a DSLR without a mirror. I understand Bob. I have friends who’ve been using mirrorless camera bodies for months (years!) and still discover new functionalities. I try to do my best with the time I’ve been given but you are right, I am currently looking at them like DLSRs without mirrors – because that’s all I know! If I do switch (which is likely to happen) I’ll make sure to post updates every 3 months or so as I get used more and more to this new technology.